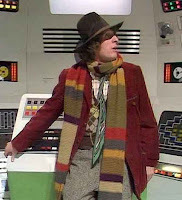 It’s no good, I’ll go with the Doctor, even if those Ood look as if they should have been confronted by Tom Baker. After all, when you’ve had your moan you have to admit that it is very, very entertaining, with its heart in the right place, even if its head is often in orbit around Jupiter. I just wish that it was not classified as science fiction. Much has been written about the plausibility or otherwise of the Star Trek universe, but it is possible to imagine at least some of the concepts becoming real. But the sonic screwdriver? I don’t think so. Doctor Who’s science is pixel thin. I’m sorry about this, but I just don’t think that you can instantly transport a whole hospital onto the moon without all of the windows blowing out. Oh! You use a force field, do you?! And there’s the trouble; one sentence makes it all okay. But it’s fun and occasionally wonderful, as in the episodes “Blink”, “Human Nature” and “The Family of Blood”. He's completely correct. The Russell Davies shows are especially bad about this. The character development and some of the ideas are wonderful, but ultimately the Doctor just changes the polarity of the neutron flow every week. Well, there was his mistake. He should have switched the polarity of the proton flow. Nothing wrong with being Science Fantasy. True, but I think that Pratchett's complaint is that the word "science" was attached to it at all.